Ford announced recently they were discontinuing sedan sales in the United States. While sedan sales have been on the decline for many years, this was still a very bold move. Presumably this left a few gaps in their model range. Given the market will buy pretty much any SUV car companies offer, the company has added the Ford EcoSport compact SUV to their line up. This vehicle was sold previously in other markets but I understand is new to North America. Compact SUVs may be popular with the public at large, but they are not popular with me. Still, I have never bought a new car in my life, so it makes sense for the Ford Motor Company to ignore people like me and listen to their real buyers. 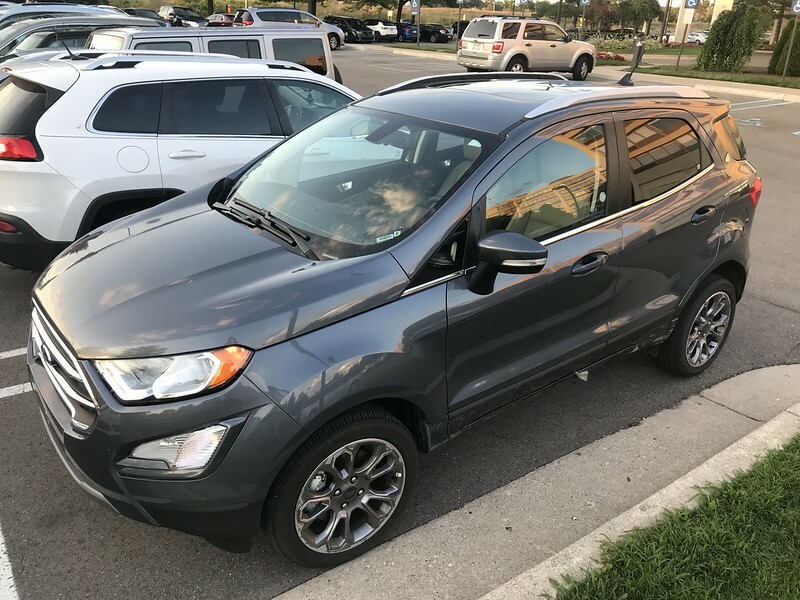 I have been renting a 2018 Ford EcoSport from Avis while traveling for work in the United States. I have the Titanium model, which I understand costs around USD $26k. Were I in the market to spend USD $25k on a new or late model vehicle, I would not buy the EcoSport. Apart from its height, the Ford EcoSport is quite small. I understand it is based on on the Fiesta platform. In the front the seats are a little narrow, but generally OK. With the front seats adjusted however, there is no room for passengers with legs at the back. Instead, because it is an SUV, you get height, and lots of it. Basically this car is for drivers who like to wear a top hat and carry dual amputees in the back. The EcoSport is equipped with a 1.0 liter 3 cylinder engine that puts out a little over 120hp. Unlike the Seat Ibiza that I tested earlier in the year, the EcoSport does have enough power and is able to cruise happily at 80mph. The engine works very hard and the fuel consumption numbers are poor in the real world. This car is available with a four cylinder engine and I’m sure this car is much better. Happily, compared to most economy models, the Ford EcoSport is equipped with a real six speed automatic transmission rather than a hateful CVT. This makes the world of difference. Even with the a very small engine, it is not bogged down trying to raise RPM and is actually quite responsive. As I rented the Titanium model, the EcoSport is fairly well equipped. 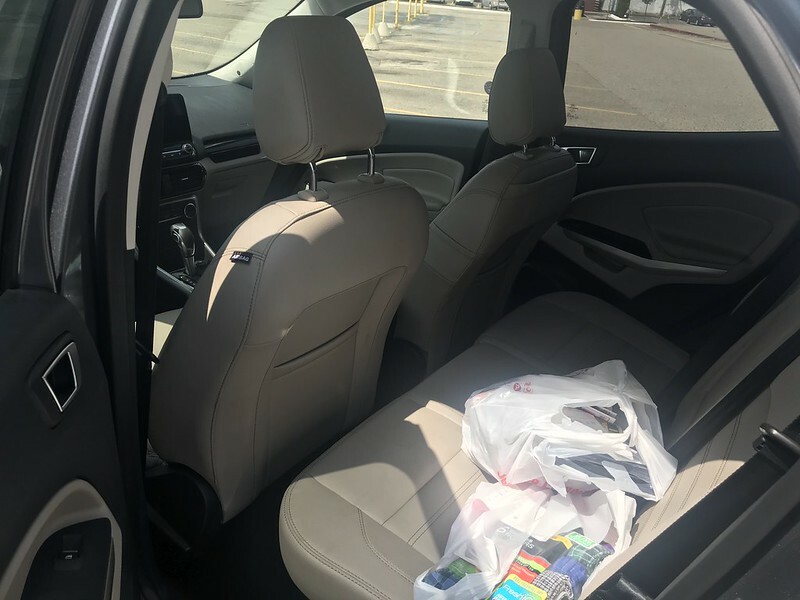 It has leather seats, sunroof, alloys, rear camera, blind spot monitoring, keyless go, navigation, USB ports for your phone, cruise control and probably more. It also comes with the Bang and Olufsen sound system. There was a time when B&O stood for high end audio systems. Sadly, that is not the case anymore and it seems they are the Donald Trump of audio companies – they will put their name on anything. Even the tinny little speakers in my HP laptop have the B&O logo on them, and they sound terrible. I also don’t get the point of the Keyless go system. You get this massive keyfob that you need to carry around with you, but now there is nowhere to put it except for the cupholder. You also can’t turn on the car without depressing the brake pedal even if the car is in park with the handbrake on. As with many SUVs, this car has blindspots galore. Thankfully this is alleviated somewhat with the reversing camera and blind spot monitoring. It also manages to have a front blindspot. Since the car has somewhat of a bubble roof, even when the seat is at its lowest, a tall driver’s eye line is right at the top of the windscreen. This means you cannot see traffic signals when stopped at the lights unless you crane your neck forward. So far this car isn’t sounding great. But the worst part by a mile is the ride, which is Terrible. The suspension is shockingly bad. Even my $230 Rover with disintegrated bushes was better than this car. Every tiny imperfection in the road is fed back to the passenger compartment. On a road with minor cracking it is like driving on Belgian pave. Even a road that looks perfectly smooth has the noise of the rear suspension going up and down to sound like the clickety clack of a train as it runs along the rails. I know Ford can do better than this. Even the biggest fan of the blue oval can find better ways to spend $26k. The most obvious is a run out model of the much maligned Ford Fusion. UPDATE 4th October, 2018. Jalopnik did a review of this car. They liked it more than I did, except they had the four cylinder engine. Even so, they couldn’t work out why people think it’s better than the Focus.